Early 19th c. map of Burlington County, showing Vincentown & Wm. Irick's property - (Coaxen Farm). 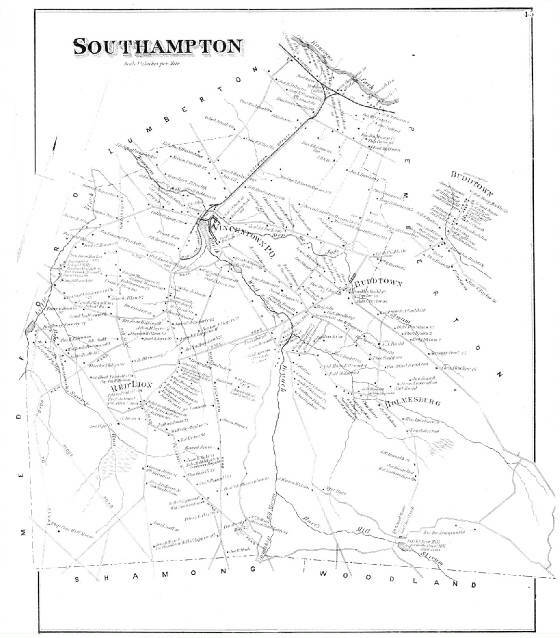 Undated manuscript map from the Burlington County library. It shows Vincent Town to the east and along the main east-west road, William Irick's house, which is the site of the Coaxen Indian cemetery. The house just west of Irick's, is set at the fork in the road, and matches the historical description of the house which was moved to this site by Isaac Ridgway while he was a tenant of the Coaxen Commissioners. The road running north from this corner leads to Eayrestown, site of the mill and property of the Eayre family. Asa Eayre was a key supporters of the Coaxen Indians and served as a commissioner of their lands. 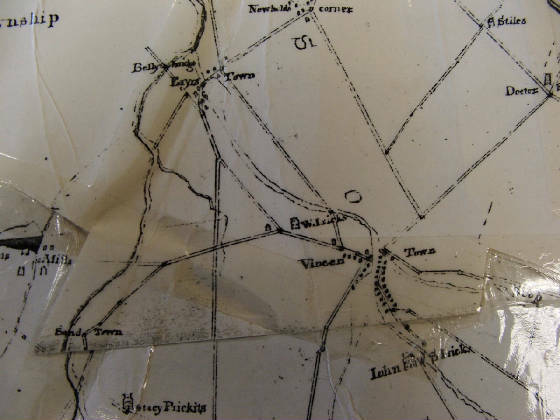 Closeup of 1876 map. Coaxen Creek crosses the Eayrestown Road to the left. The Wills family of West Jersey were committed to securing the rights of the region's Indian population out of a recognition that the Indian generosity towards the early settlers enabled these colonists to flourish and create a new world for themselves. In 1740, Daniel Wills deeded the Coaxen land to the family of sachem Opollonwhen so that clear title to the land would remain in Indian ownership forever. According to native custom, the land was to belong to all the family and kindred of Opollonwhen. These included his two brothers and his children (and relatives). As outlined by Foster below, some of the inheriters left no direct issue. One of the sons, Moonis, or Jacob Mulis, left the property by will to his three children in 1784. Charles Moolis was the sole surviving child of Jacob when the former died in 1798, leaving the land by his will to Josiah Foster. Using legal argument that only Charles Moolis had sole possession of the land, Foster ommitted the fact that the land belonged to the extended family of Opollonwhen, and was considered by the Brotherton Indians and the State of New Jersey as part of the Indian lands held in common. Foster's claim to the land was contested for twenty years and was widely unpopular with local residents who resented his method of gaining Charles Moolis's signature on a dubious will. However, by 1819, the Indians involved had long since moved on. A civil case in federal court by Foster to eject some of the tenants on the property resulted (although the record is incomplete) in the federal court recognizing the validity of Charles Moolis' will. Foster did not enjoy his victory; old age and debt led him to transfer his interest in the land to his two attorneys who had represented his case in court. "This indenture made the 8th day of October 1740, in the 14th year of the reign of our Sovereign Lord George 2d, over Great Britain France, and Ireland, between John Wills of the township of Northampton in the County of Burlington and Province of New Jersey (Gentleman), of the one part and the children of the late Indian King Opollonwhen, late of the township of Northampton, in the County and Province aforesaid, deceased, and his two brothers, called by the names of Teaunis and Moonis, Indians and natives of the westerly division of the Province of New Jersey, of the other part; Withnesseth, that the said John Wills for and in consideration of the sum of four shillings Current money of the aforesaid Province of New Jersey, to him in hand paid by the said Children of the said Indian King, and Teaunis and Moonis, his two brothers, at or before the ensiling and delivery of these presents, the receipt whereof, he the said John Wills doth hereby own and acknowledge, and thereof and of every part and parcel thereof doth hereby acquit, release and discharge said Children of the said Indian King, and the said Teaunis and Moonis, and every of them forever by these presents, and also for and in Consideration of the good will that he has to the children of Opollonwhen and his two brothers, Teaunis and Moonis, that they might have perpetual habitation for their generation, offspring, stock, or kindred forever; has given, granted, bargained, sold, aliened, enfeoffed, released, conveyed and confirmed, and doth by these presents, fully, clearly, and absolutely give grant bargain, sell, alien, enfeoffed, release, Convey and Confirm unto the Children of Opollonwhen and his two brothers Teaunis and Moonis, and their progeny forever; All that tract of land and plantation, situate in the forks of the Rancocas or Northampton River in the Township of Northampton, in the County of Burlington, and Province of New Jersey, and by the survey thereof lyeth thus bounded. Beginning at a Maple, marked with the letters B V R R, standing on the south side of the middle branch of the Rancocas, commonly called Ayres Mill Creek, and at the mouth of a small run of water, and runs thence by the land of John Burr, (1) south 30° 30´ E. 91 ch. 18 links, to a black oak by the head of said run; thence (2) still by said Burrs land, south 52° W. 62 ch. 50 links to a dead black oak with a living white oak by the side of it Marked for a corner; thence (3) by said Burrs, N 75° 30´ W. 12 ch. to a large White oak tree on the east side of Coaxen Run; thence (4) by the land of Daniel Wills, N 5° W. 21 ch.40 links to a White Oak; thence (5) by said Wills N. 43° W. 8 ch. to a stake; thence (6) N. 21° E. 1 ch. 50 links to a stake; thence (7) 23° W. 10 ch. to a stake; thence (8) N. 43° 30´ E. 18 ch. 50 links to the creek; thence (9) up the same south 88° (N. 43.30) 10 ch. 50 links; thence (10) S. 40° 30´ E. 2 ch. 50 links; thence (11) S. 40° E. 9 ch. ; thence (12) S. –° E. 6 ch. 40 links; thence (13) N. 22° E. 8 ch. 50 links; (14) S. 84° 30´ E. 4 ch; thence (15) S. 39° E. 8 ch. 50 links; thence (16) S. 57° E. 5 ch; thence (17) N. 67°E. 6 ch. 50 links; thence (18) N. 20° E. 8 ch. ; thence (19) S 53° 30´ E. 7 ch. 16 links to the place of the beginning, containing 242 acres with allowances for highways; which land being part of a warrant granted to him from the said John Wills from the Council of Proprietors, for the taking up of a quantity of 624 acres of land in the 5th division or taking up; bearing date the 9th of May, A.D. 1740, which said warrant being in the surveyor-general’s office will more and at large appear; and which share of land became of right to him, the said John Wills, by the last will and testament of his father Daniel Wills, deceased, bearing the date 25th March, 1698, and was by the said Daniel Wills purchased of William Biddle and Mary Olive, one-quarter part of a property, as by said deed, bearing date the 6th day of October, 1693, will appear at large in the Secretary’s Office in Burlington, Liber B, folio 336 and 337, recourse being thereunto had; together with all the houses, fences, and improvements whatsoever upon the said land, made an done, with all the mines, minerals, woods, underwood, fisheries, fowlings, hawkings, huntings, and all other the royalties, profits, hereditaments, and appurtenances to the said 242 acres of land an plantation bellowing or in any wise [way] appertaining, and all the estate, right and title, interest, property, possessions, claims and demands whatsoever of him the said John Wills, both in law and equity of, in, or to the said granted and bargained 242 acres of land an plantation and premises, and every part of a parcel thereof, with their and every of their appurtenances, and the revertions and remainders thereof, and of every part or parcel thereof. To have and to hold the said 242 acres of land an plantation, and every part and parcel thereof, with their and every of their appurtenances unto the children of the said Opollonwhen, and to his two brothers Teaunis and Mooris [Moonis], and their progeny, so long as the waters run in the lower Delaware and Rancocas or Northampton rivers, to their only proper use, behoof of the children of the said Opollonwhen, and his two brothers Teaunis and Morris [Moonis], and their generations, offspring, stock, or kindred, and to each of them as the said land may descend according to the custom used among the said Indians forevermore. And the said John Wills for himself, his heirs and executors, covenants grants and agrees to and with the children of the said Opollonwhen and his two brothers, and their progeny by these presents in manner and form following, that is to say. That the said John Wills, at the time of the sealing and delivery of these presents, is and standeth lawfully and rightfully seized of and in the said 242 acres of land, plantation, and premises, and every part and parcel thereof, with their and every of their appurtenances, as of a good, sure, absolute and indefusable estate and inheritance in fee simple, and now hath good right, full power, lawful and absolute authority in business to grant, bargain, sell, alien, enfeoff, release, convey and confirm the said granted and bargained 242 acres of land, plantation and premises as above limited and bounded as the map thereof is thereto annexed, unto the said children of the said Opollonwhen and his two brothers Teaunis and Moonis, and their progeny forever, according to the true intent, purport, tenor, and meaning of these presents; and that is shall and may be lawful for the children of the said Opollonwhen, and his two brothers Teaunis and Moonis, and their progeny from time to time, and at all time forever to transfer by the virtue of these presents, quietly and peacefully to have, hold, occupy, possess, and enjoy all and singular, the said 242 acres of land, plantation and premises, by these presents mentioned, with there, and every of their appurtenances without the lawful let, suit, trouble, hindrance, erection, ejection, or any other interruption of him the said John Wills, his heirs, executors, administrators or any other person or persons whatsoever lawfully claiming or pretending to claim any par of parcel thereof. The Quitrents thereout issuing unto our Sovereign Lord the King, his heirs and successors with arrears thereof, if any, be only accepted. And the said John Wills, for himself, his heirs and executors, bargains, grants and agrees, to and with the said Children of the said Opollonwhen, and his two brothers, Teaunis and Moonis, and their progeny, and by these presents, that the said granted, bargained 242 acres of land, plantation and premises, and every part or parcel thereof, with their and ever of their appurtenances unto the said Children of the said Opollonwhen, and his two brothers, Teaunis and Moonis, and their generation, offspring, stock, or kindred, or to such of them as the said land may descend, according to the custom and tradition used among the Indians, so long as the water runs in the river Delaware and Rancocas or Northampton rivers, against all and every person or persons whatsoever claiming, or that shall or may at any time or times hereafter lawfully claim any estate, right, title or interest of or to any part or parcel thereof with their, and every of their appurtenances; shall and will forever warrant and defend by these presents. In witness whereof the party first above named in these presents have to this Indenture set his hand and seal this day and year above written.